Children the world over have been enchanted and captivated by the charismatic being known as Santa Claus, Father Christmas, St. Nick, Sinterklaas, and PapA Noel. But eventually, they begin to ponder just how, with the help of flying reindeer, he can deliver presents to boys and girls all around the world in only one single night. And how does he fit down chimneys? And visit houses where there are no chimneys? As the questions begin to multiply, THE SECRET OF THE SANTA BOX helps parents guide their child from an innocent belief in the fanciful realism of Santa Claus to an empowered understanding of charity, love, and goodwill, and the true meaning of the celebration of Christmas: the birth of Jesus Christ. 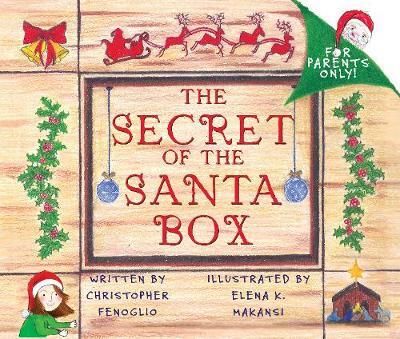 THE SECRET OF THE SANTA BOX by Christopher Fenoglio and illustrated by Elena Makansi, is a delightful story written in the same lyrical style as'Twas the Night Before Christmasthat helps parents navigate this difficult terrain in a fun and loving way, andis a natural transition for children who have outgrown the "Elf on a Shelf" and are ready to move forward to the real meaning of Christmas. "Chris Fenoglio makes it easy for parents to delicately share the mystical meaning of the spirit of Christmas with their children." "In the same way so many people can recite The Night Before Christmas from memory, The Secret of the Santa Box has all the makings of a new holiday classic. Filled with wonderfully nostaligic imagery that immediately evokes the Christmas spirit, The Secret of the Santa Box celebrates wonder, the thill of hope, giving, and God's goodness in beautifully crafted verse that, like a great song, can't help getting stuck in your head. "Fresh, funny, original and perfect for girls and boys everywhere. Christopher Fenoglio has created a holiday poem for children of all ages." "There is nothing like The Secret of the Santa Box in the marketplace. For parents with children, this book will be a true keepsake. This tender, sweet poem captures the essence of Christmas and provides a special tool for teaching children about Santa, about giving and about love." "This is the best Christmas book to become a classic since 'Twas The Night Before Christmas. If families will read this book to prepare and figure out how to transition into new Christmas traditions as their kids get older, this world would be a better place." "Ultimately, it was important for (the author) to teach his children that Christmas is all about Jesus. And, ultimately, that is what all Christians want for their children as well." "If you've ever struggled with how to tell your child the real truth about Santa, this book makes it easy. It's sweet, inspiring and based on a true story." "Chris has masterfully written a short story for children who are moving beyond the mystery of Santa, to colorfully introduce them to the marvelous beauty of the true miracle of Christmas." "The Secret of the Santa Box is a delightful poem and a wonderful way to discuss with your children the true meaning of Christmas." " The Secret of the Santa Box is a wonderful way to help maturing children see Christmas in a whole new way. Fenoglio does a wonderful job of ushering young people into an adult understanding, while still protecting the magic of Christmas." "Beautifully illustrated to quickly become a family treasure, this wonderful little secret will surely be kept for generations to come."